Posted: October 12, 2008 | Author: dpod | Filed under: Applications, Linux, Technical Notes | Tags: applications, bibliographic software, cloud computing, Computers, RefDB, Research, servers |Leave a comment » RefDB is a powerful, open source, bibliographic database program and server developed by Markus Hoenicka with some assistance from others, including me. 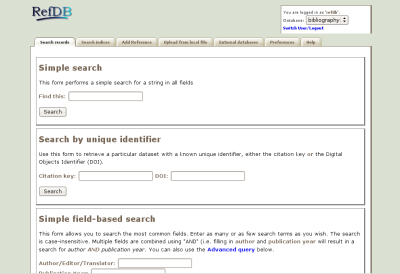 It can import and export references in a variety of formats, including bibtex. TEI P4 and P5 XML, Docbook, RTF (export only), and various flavours of MARC (import only). It is broadly similar to Refworks in functionality and capabilities. In my experience RefDB is much faster (and of course adaptable and free); Refworks has more polish (as you would expect from a commercial house). To run refdb from the command line, you need to install some Perl packages and a database such as MySQL. To run it using its web-browser interface, you need to have a computer that can run a webserver like Apache and PHP. The following is a guide describing how I installed RefDB on Ubuntu Linux. Text in monotype is the name that installs the package in apt-get, using the command sudo apt-get install <package-name>. For CPAN modules, use the CPAN installer sudo cpan followed by install PACKAGE::Name at the CPAN prompt.